Crock pot beef tacos. This simple old fashioned pot roast morphs into tasty tacos. Crock pot beef tacos are beautifully flavored with Southwestern seasonings and finished with a crunch of cabbage. And what about that flavor? It definitely shows up for the party. And tips on how to heat corn tortillas for a steamy warm taco. Just What Do I do for a living? I’ve had many readers ask about my career. I work in the Real Estate Industry as a Sales Executive for Heritage Title. What’s a title Insurance company? We do a lot of important things to insure against fraud, but we’re most famous for our end result where we gather Realtors, Lenders, Buyers and Sellers around a closing table and make everyone sign documents until their hands cramp and then we hand over the keys to the American dream, a new home. It’s either feast or famine in our business, and let me tell you it’s a feeding frenzy feast right now. Buyers are standing in line to preview homes, multiple offers are flying into seller’s hands which results in bidding wars with sellers getting $20 to $30 thousand over the listing price. What does all this boil down to? It’s a great time to sell a home and with interest rates still so low, it’s also a good time to buy. And all of us in the industry are running so fast to keep up that we’re out of breath. That’s a good thing. And yes, I need easy weeknight meals. With that out of the way, let’s make some crock pot beef tacos. Update: As of 2017, I have retired from the corporate world, attended and graduated from Culinary School and am now focusing full time on my food blog. This crock pot roast beef taco recipe was a life saver this week. So very easy and with plenty of leftovers for a couple of quick dinners. Simple with seasoning and big on flavor, the meat went into the crock pot before I went to work and I arrived home to an aromatic party that filled every nook and cranny of our house. I used a good ‘ol chuck roast, and as with any slow cooked meat, it was fall apart, melt in your mouth wonderful. This recipe is popular in this house because we’re fans of ancho chili powder. And simply adding cumin, cayenne and bay leaves, I knew the flavors would be to our liking. You could take the time to fry and shape your own corn tortillas into tacos. But to keep things weeknight easy just heated up soft white corn tacos. Once this meat is cooled and the beef shredded, just serve with your favorite taco toppings. A crunch of shredded cabbage, a slice of avocado and a salsa. We served this with my homemade Roasted Tomatillo Salsa. Or a tomato based salsa like this Essential Mexican Restaurant Style Salsa would be fabulous. 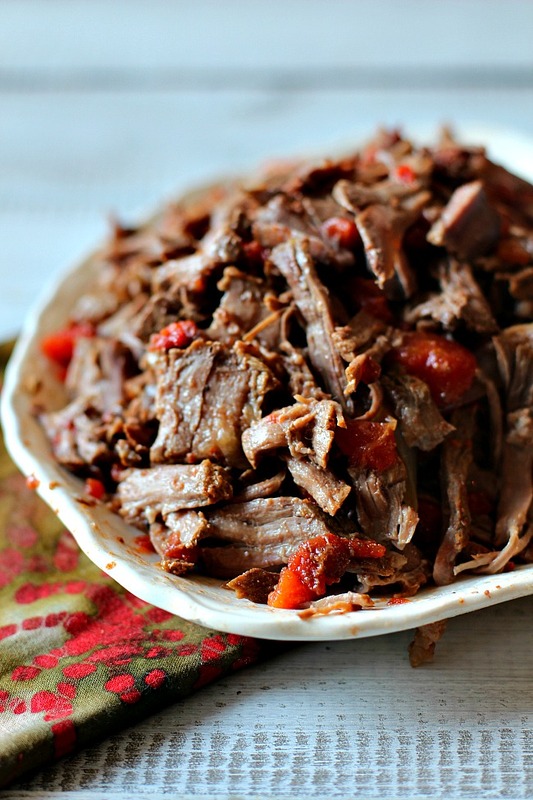 Whatever you choose, give this slow-cooker shredded beef pot roast taco recipe a try. So easy, so big on flavor. Season all sides of the beef with a fair amount of salt and pepper. In a large Dutch oven, or if your crock pot has a stove top insert, heat 2 tablespoons of olive oil over moderately high heat. Add the garlic and the beef to the pot, browning the meat on all sides, taking the time to get a nice crust on the outside. Add the onion and allow to lightly brown, about 3 to 4 minutes. Add the crushed tomatoes, 1 cup of water, spices, season with salt and pepper to taste. Cook in crock pot on low for 6 - 8 hours. Let meat cool in the liquid. Shred meat and set aside. Warm corn tortillas by dampening a clean kitchen towel with water. Place the corn tortillas on the wet towel and fold the towel over the tortillas. Place the package in a gallon zip lock bag, but do not seal. Place them in the microwave and cook for two minutes at 50% power. Let them steam in the bag for 4 minutes before removing. In the meanwhile, make the Tomatillo Salsa. 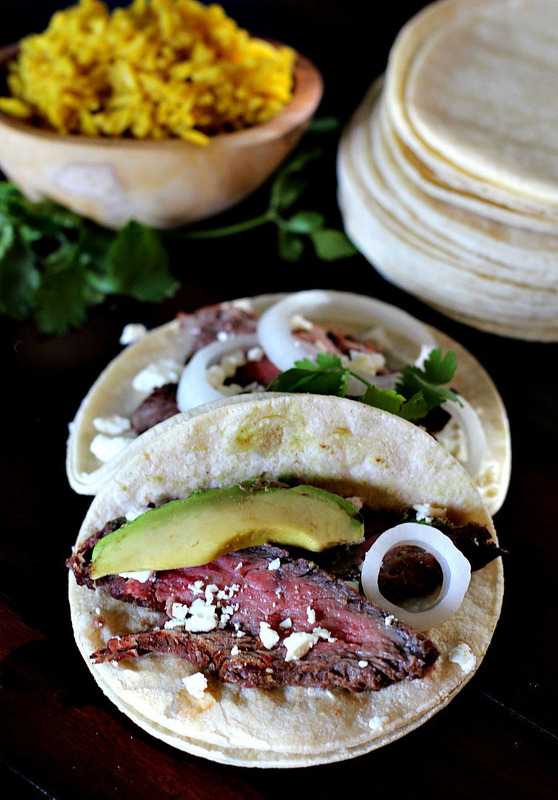 Tyler Florence’s Crock Pot Roast Beef Tacos … It’s What’s for Dinner. I love easy crock pot meals like this for busy days. Sounds delicious!! Thanks so much for stopping by and the comment Deborah. I’ve been enjoying your blog. I like Tyler Florence, he definitely has some wonderful recipes. Looks fantastic! I agree! I used to follow his blog. Don’t know what happened there. My crock pot is long gone, Lea Ann. I’m always tempted when I see so many slow cooking recipes, but then my family is grown and moved out of this area, so when I see something I’d like to make, I adapt it to stovetop. So thanks in advance for that…this looks marvelous and I love Tyler recipes! Sometimes you just can’t time major decisions like that at just the right time. You and Sam have both given up your crockpots. You need to get at least a small one. Great to hear from you Barbara. We really enjoy tacos and I do need to use my crock pot more! Every day seems to be a busy day in our lives, even with every attempt to simplify! So glad to hear the real estate market is picking up. We have a condo that my husband inherited that is in Florida. It has been for sale for 2 years and only lookers. We keep lowering the price, putting money into it to update it, but still no takers! And it is right on the inter coastal waterway! I keep praying for this burden to be removed from our lives! Keep sending the positive vibes! Yes, I have friends that own property in Florida and they’ve tried to sell it for years. Really a good time to buy there. I’m so sorry to hear it’s a burden. Darnit. Positive vibes are headed your way. So you’re the lady that knows the whole closing by heart. Just was there and she was amazing how she knew the answers to everything and explained up front anything that needed explanation. Cooking the tacos in the crock pot sounds like a great idea. Wish I hadn’t given mine away. BTW, I can now follow you on Feedly and Bloglovin’, so when I disappear from your mail list, you’ll know what happened to me. Sure don’t want to miss any good eats as Alton Brown would say. Looks and sounds delicious LA and glad to hear business is booming. My daughter is a realtor and says she has been very busy also. This is coming to you from an RV park in Sevierville, TN as we are finally having our maiden voyage. I knew your daughter was a Realtor, and glad to hear things are good in Texas also. Can’t wait to hear about the maiden voyage. This taco recipe sounds divine!! And love the simplicity of making it in the crock pot! It’s the greatest thing to come home to a crock pot meal after a long day at work. The house smells so good and it’s like there was no work to it! This sounds like a really good recipe. You’ve got that right. Thanks Karen. So I’m totally craving beef tacos now, betch ya I have them before the end of the week. It’s such good news that the housing market is taking an upward turn! More like a soar. It won’t last forever. Real Estate is a roller coaster. You should try this recipe, it’s a good one. I like how you think Susan. With us food bloggers, any calorie burned is worth a celebration. Shredded beef with those wonderful seasonings sounds like something I would love. Tri tip always cooks up so nicely, too. I’m loving my Costco try-tips. Well, I’ve been buying them for years and years. I just did a Santa Maria Tri-tip and will be blogging about that one. So wonderful. Hopefully your equity is seeing better days. Always a roller coaster. That sounds fantastic and yes, the leftovers rock. I could see putting a little of this, some diced veggies on a tostada and topping it with a fried egg for breakfast. OMG, sounds like a winner. Wish I still had leftovers so I could do that.